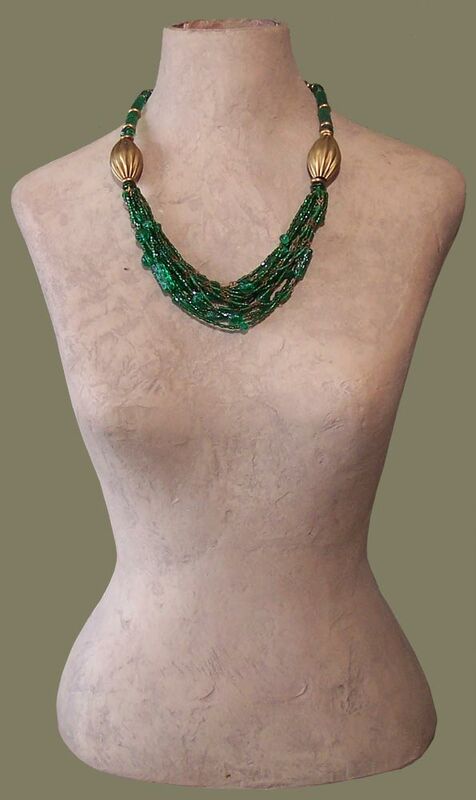 “Green With Envy” Necklace: Vintage Glass Beads Abound in This Exclusive, One-of-a-Kind Beaded Necklace by Carol Tate. Emerald Green Has the Spotlight in a Variety of Unique, Dimpled European Molded Glass Beads, and Tiny Vintage Glass Seed Beads. Stealing the Show, However, are Two Extraordinary, Recycled Solid Brass Beads…Big, Chunky Metal Beads, Elliptical in Shape and Fluted. These Beads are Thickly Cast and Measure 1” Wide by 1.5” in Height. This Chunky Bead Necklace is Fitted With a Large Solid Brass Hook and Swivel- Eye Closure. Costume Jewelry With a Chunky Jewelry Attitude… Make Them Envious!